Ford dealers are finally receiving the all-new 2019 Ranger. Base MSRPs range from about $25,000 to just under $40,000. Prices will be on the high side for some time to come. A high-performance Raptor model is reportedly in the works for the 2020 model year. If you don't want to wait, the regular Ranger offers some impressive capabilities with the right options. Current factory offers vary by region and are scheduled to end July 1, 2019 unless otherwise noted. Examples below are for California. Ford often modifies incentives prior to their expiration date. Starting April 12, all 2019 Rangers are eligible for a $500 rebate. There's also a $1,500 bonus available when switching brands. To get it, you'll have to own or lease any 1995 or newer non-Ford car or truck. That's $2,000 in combined savings, the most offered to date. Well-qualified buyers can get 1.9% financing for 60 months on any 2019 Ranger. You'll have to give up the $500 rebate mentioned above, but can still enjoy the $1,500 bonus. Based on our analysis, most buyers will probably save more money by taking the financing. You can lease a 2019 Ranger XLT 4x2 SuperCrew (301A with 2.3L engine) from $299 for 24 months with $2,999 due at signing. The deal includes an allowance of 10,500 miles per year and equates to an effective cost of $424/month. However, shoppers should be aware that Ford's advertised deal includes the $1,500 bonus for switching brands. It's also worth knowing that incentives on the F-150 are generally more favorable, which could make the larger truck a smarter choice for those looking to get more for their money. It's been eight years since the old but popular Ford Ranger was sold new here. In that time, Blue Oval fans hankering for a less-than-full-size truck were forced to endure the ignominy of buying a Toyota Tacoma, Nissan Frontier, or, heaven forbid, a Chevrolet Colorado. That's finally no longer the case. With the mid-size truck market up over 80 percent since 2014, the business case was too strong to keep the Ranger off-limits for Americans any longer. The arrival of the 2019 Ford Ranger marks not only a grand return of a storied name, but also helps keep the flames burning under the bottoms of the competition. The Ranger is all-new for America. Elsewhere in the world, buyers have been able to purchase this same truck since 2015. Upon the official opening of the ordering books, buyers will have a choice between three trim levels and two cabs, with the extended cab sporting a six-foot bed and the crew cab a five-footer. Only time will tell if the coming years will bring the excessive level of choice boasted by the F-150. Regardless of what trim or cab is selected, all Rangers will use the same 2.3-liter turbocharged four-cylinder engine hooked up to a 10-speed automatic transmission. The motor's 2.3 liters of displacement might seem a little weak-chested for what's supposed to be a butch machine, but this little squirt has gumption – there's 270 horsepower and 310 pound-feet of torque hiding in those four cylinders. The power puts the new Ranger at the top of its class, beating out the optional V6s of the Colorado, Tacoma, and Frontier. With the best-in-class power also comes best-in-class capability. Ford claims 7,500 pounds of trailer-hauling ability when equipped with the $495 Trailer Tow Package and a trailer brake controller, and 1,860 pounds of maximum payload capacity. The closest a competitor comes to touching these numbers is the Colorado's 7,000-pound tow rating or the Tacoma's 1,620 pounds of maximum payload capacity. Off-road gumption isn't quite the level of the F-150 Raptor – though rumor has it a Raptor version might one day make it stateside – but the Ranger can still hold its own when the going gets rough if it's equipped with the $1,295 FX4 Package. Included with the FX4 are off-road-tuned shocks, all-terrain tires, skid plates, and a four-mode terrain management system. There's also what Ford calls Trail Control, which is in essence a cruise control for off-road applications. Set your desired trail speed, and the computers take over acceleration and braking duties, leaving you to focus on steering through the course. The FX4 requires four-wheel drive, which costs $4,160. All Rangers come equipped with automatic emergency braking, even the base XL. XLT and Lariat models add lane keeping assist, lane departure warning, reverse-sensing, and blind-spot monitoring to the mix of active-safety features. Lariat models go one step further with pedestrian detection and adaptive cruise control. Widely-available options include Ford's famous door-mounted keypad ($95), running boards ($635), and an electronically-locking rear differential ($420). The cheapest way into a new Ranger is the $25,395 XL model (all prices include the $1,095 destination charge). The most frugal option here is also the most kindred spirit to the old workaday Rangers with their rubber floors, vinyl bench seats, and AM radios. The new one isn't that devoid of creature comforts, but the standard features list is nonetheless rather short. Buyers get front bucket seats with cloth upholstery, a 2.3-inch driver information center, single-zone manual climate control, intermittent wipers, and a manual tilt and telescope wheel. 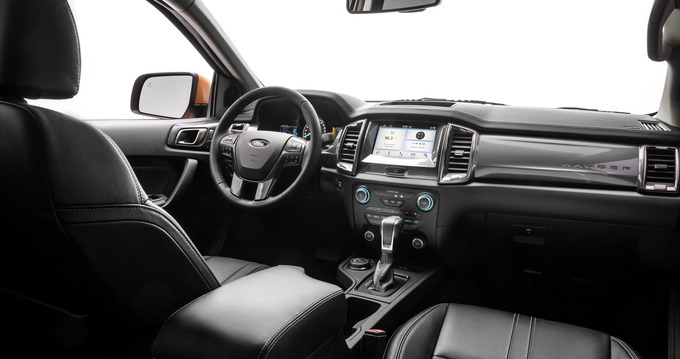 Audio and connectivity features include a six-speaker stereo with a USB port and SiriusXM, a wifi hotspot, and Ford's Sync infotainment software. The exterior is typical base-spec truck stuff – black bumpers regardless of body color, no chrome to speak of, and 16-inch steel wheels. Lights are halogen, the tailgate is manual locking, and the exterior mirrors are adjusted manually. The primary package that most buyers will want is simply called the 101A equipment group. For $1,135, it includes power adjustable mirrors, cruise control, an alarm, and a remote key fob with tailgate lock. A $365 Chrome Appearance Package can be had as well if 101A is selected. Those who like the trail-ready style but don't need the hardware might consider the STX Appearance Package. It costs $995 and includes 17-inch wheels, premium cloth upholstery, STX graphics, painted black bumpers, fog lights, and tow hooks. The $735 Ford Co-Pilot 360 brings a small suite of active-safety features to the table, including blind-spot monitoring with rear cross-traffic alert, automatic high-beams, lane keeping assist, and trailer-tow monitoring. The $29,035 XLT sits in the middle of the Ranger lineup. Compared to the XL, it offers additional standard features such as power mirrors, a power-locking tailgate, a defrost-equipped rear window, a 4.2-inch driver information screen, automatic high beams, cruise control, and lane-keep assist. Two value packages are offered: 301A and 302A. The former is $995 and includes the Sync 3 infotainment unit with an up-sized screen, a leather-wrapped steering wheel and shifter, power-folding mirrors, and SiriusXM radio; the latter is $2,800 and includes all the aforementioned as well as eight-way power front seats, remote start, a manual-sliding rear window, and a sport appearance package that's comprised of painted black trim, unique 17-inch wheels, and a painted black grille. It also can be tacked onto 301A for another $795. A Chrome Appearance Package is available if 301A has been selected. It's $795 and comes with chrome bumpers, door handles, exhaust tip, running boards, mirror caps, tow hooks, and 17-inch wheels. In other words, anything that can be chromed is given a healthy dose of the shiny stuff. If you're wanting more tech in your truck, there's a $795 Technology Package that includes navigation, Sync 3, and adaptive cruise control. The range-topping Ranger Lariat comes with all the bells and whistles Ford could throw at it for $33,305. There's 18-inch wheels, LED lights, a chrome grille, heated power mirrors, a 10-speaker audio system for Crew Cabs, SiriusXM radio, Sync 3 infotainment, leather upholstery, and eight-way power seats. The 501A equipment group costs $1,795 and ups the ante with navigation, rain-sensing wipers, remote start, and a windshield-wiper de-icer. 501A-equipped crew cabs also get a 10-speaker Bang and Olufsen audio system. Both the Chrome and Sport Appearance Packages that are found on the XLT are available here as well. Whatever 2019 Ford Ranger trim tickles your fancy, don't leave the dealer without getting one of the value packages. Besides unlocking access to other desirable options such as the Technology or Appearance Packages, they also include features most would deem indispensable these days. After an eight-year hiatus, the Ford Ranger makes a comeback for 2019. As Ford repositions its lineup to focus on larger vehicles, the Ranger occupies a valuable niche below the bestselling F-150. It’s not the boldest debut package, and it doesn’t come cheap, but the 2019 Ford Ranger does an admirable job marrying utility with economy. Many buyers will (understandably) opt for the mid-range XLT trim, but for all-out value, the base trim can’t be beat. Most importantly, it gets the same powertrain as the rest of the lineup, with more towing power than most buyers will ever need. The cheapest Rangers are extended-cab models, but it’s worth springing $2,220 to upgrade to the crew cab. The extended cab’s second row is best suited to storage rather than actual passengers. Rear-wheel drive is standard, and four-wheel drive is around $4,000 extra, depending on trim. That’s exorbitant, but sadly it’s par for the course among mid-size pickups. The starting price has already swelled over $30,000, but we’re not done yet – this is why it’s good to start with the base trim. An equipment group adds back essentials like cruise control and power mirrors, while a bed liner, a towing package, and an electronic locking rear differential ready the Ranger for duty. Finally, the STX Appearance Package adds more supportive front seats (along with alloy rims). A typical pickup driver might be disappointed to learn that the Ford Ranger offers only one engine, and that it only has four cylinders. The feeling would be unwarranted – the turbo-four pumps out 310 pound-feet of torque and allows an exceptional 7500-pound towing capacity. The 10-speed automatic transmission is quick and smooth. The handling is precise, and the ride is compliant without being bouncy. The available part-time four-wheel-drive system is controlled via a knob on the console, and an available off-road package adds a variety of all-terrain upgrades, including a crawl control system. Even the Ranger’s fuel economy is impressive, beating out other mid-size trucks with an EPA-estimated 23 miles per gallon combined on rear-wheel-drive models. Our only real complaint is a loud cabin. The top-trim Lariat introduces extra deadening into the cabin, but even then, more wind noise enters than we'd like. Despite the available package, Ford also hasn’t released a dedicated off-road model like some competitors. The new Ranger isn’t exactly bold, but it’s one of the more stylish entrants in a generally unimaginative class. The front end neatly frames Ford’s hexagonal grille, while cutouts down the side lend some personality to the profile. Extended cab trucks come with a six-foot bed, while crew cab models use a five-foot one. The crew cab offers plenty of space for four adults, and seats are supportive on most trims. The trim lineup is widely customizable and covers more than $20,000 from cheapest to steepest. One final high point is safety: all Rangers roll off the line with standard automatic emergency braking, a claim only the Toyota Tacoma can match. In another nice touch, extra safety features like blind-spot monitoring and lane keeping assist are reasonably priced and available on all trims. The interior of the Ranger is less inspiring. Hard plastics abound, none of the interior colors are lively, and the lower trims come with tiny 4.2-inch radio screens. Even the Lariat trim’s stitched-leather dash isn’t enough to elevate the feel. Options can also get expensive, and a kitted-out Lariat will set you back close to $50,000. The performance and utility of the Ranger and its engine ought to win over most of the naysayers. We wish that Ford had spent a little more effort on the interior, though. For drivers who don’t need the superlatives (or the bulk) of the F-Series, the Ranger is a worthy alternative. It has all the utility a mid-size pickup could ever need, with a strong powertrain and surprising fuel economy. It even handles well. Buyers expecting either a bargain or a luxury experience should look elsewhere. The Ranger can offer strong value in the right trim, but nothing comes particularly cheap. Although they’re pricey, the top trims don’t feel truly luxurious. The 2019 Ford Ranger is a fitting re-entry to the world of mid-size pickups. It has the brawn to be expected of Ford trucks, but with perks like better efficiency and easier drivability. It’s not perfect, but it deserves to be on the shortlist of many buyers.